The cover of the first issue, and an actual illustration from the era. Someone has really done their homework! As anyone who has read this blog will know, I am a huge fan of the suffragette movement of the Victorian and Edwardian eras. 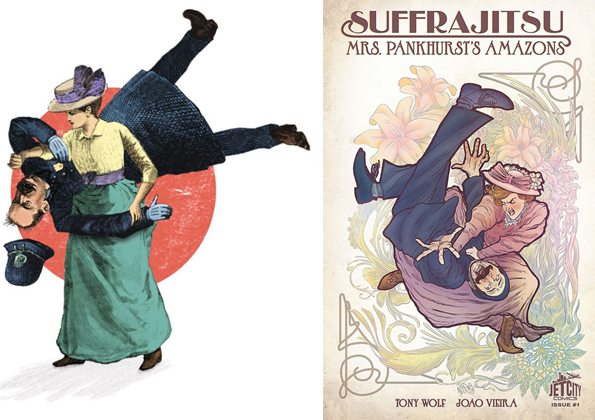 I have been looking forward with anticipation to the graphic novel, Suffrajitsu, written by Tony Wolf (originally from New Zealand, go the Antipodes) and illustrated by João Viera. It is with great delight I can write a review about Issue One of the trilogy, as published by Jet City Comics. Before we go any further, let’s address the elephant in the room … yes, a man has written a graphic novel about the suffragettes. I write about male historical characters. 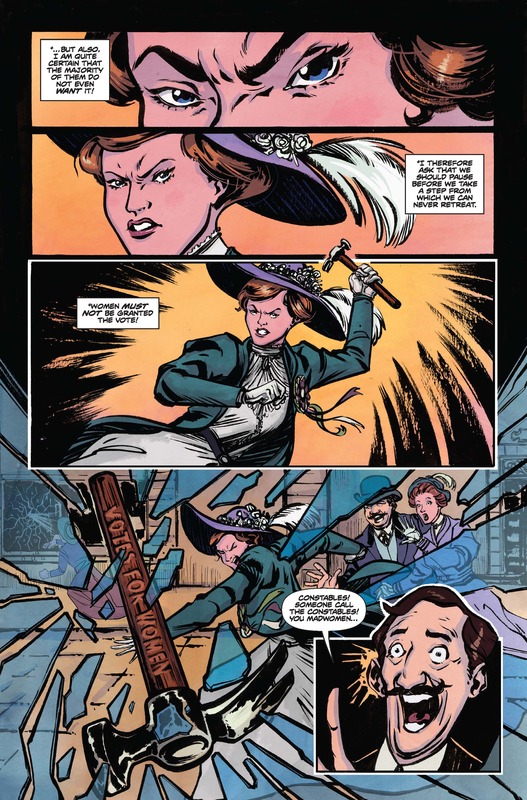 It is what writers do, and I personally think Tony Wolf has one an amazing job in recreating the pressures and problems the suffragettes faced historically, while still writing an alternative history adventure. This just isn’t a historical retelling of the suffragette movement … it is an alternative history, a might have been. This is a Steampunk narrative because it had several the major genre markers. The Steampunk literary genre embraces the use of alternative histories, and often uses historical people as characters … but the characters in the fiction are only inspired by these real people. The Steampunk genre includes anachronistic technology, such as the train the Amazons use to travel to Glasgow; this train is a “suspension railway” monorail. The technology for that type of transportation did exist in 1914, but there were no actual cross-country suspension railway lines at that time. The suffragettes are using innovative techniques to defend themselves, breaking the stereotype of the frail, helpless and hysterical Victorian female, and replacing her with intelligent and determined women who know how to handle the physical assault of an assailant. This type of woman did show up from time to time, but she was an exception rather than the rule in most Victorian and Edwardian media. Image from the Illustrated Police News. The illustrator, Viera, has made each character quite distinct. He uses a rich pallet of colours, which is an excellent choice. Popular culture tends to believe that the Victorian era was dull thanks to the B&W photos of the era. The bright colours are much more realistic, as the Victorian actually were quite lavish in their use of colour. Viera adds historically authentic details to his artwork, such as the violet, green and white ribbons and sashes used by the suffragettes. The action scenes are realistic. I’ve read a lot of graphic novels, and getting the artwork to match the writing seamlessly is a hard slog. The text and the illustrations are working together and not pulling in different directions, with the writer and illustrator well matched. Main character is Persephone Wright: her uncle is Edward W. Barton-Wright, and she is a master of Bartitsu, the martial art that he developed and taught. She is a staunch supporter of Mrs Pankhurst and her daughter, Christabel. Her characterisation is complex, as she is also a bit of a ‘wild child’, enjoying tobacco and cocaine – in an era when both were freely available. She reminds me slightly of Doctor Grace from Murdoch Mysteries, intelligent, determined, and not afraid to try new things. The secondary characters haven’t been left as two dimensional personalities and have their own distinct styles. I like that Flossie is from New Zealand, as New Zealand and Australia certainly had their own contingent of suffragettes. These real life touches give the whole story its verisimilitude. The forced feeding of suffragettes is mentioned. The suffragette movement is forced to use ‘amazons’ to protect the speakers at rallies. The ‘amazons’ are highly trained, but they don’t rely on brute force alone. In this first issue, we get few hints as to the identities of the true villains of this narrative. But – rest assured – there is plenty of conflict and action provided by the clashes between the suffragettes and constabulary, and between the suffragettes and the establishment. I recommend this graphic novel to fellow Steampunk enthusiasts, feminists, and anyone who enjoys a finely made story. Excellent, a book I might actually be able to read! Thank you for your kind comment, Ged. It is a rip-roaring read. Nice review, thanks. From the title this sounds like something I’d really want to like and enjoy but that there’d be a lot of potential for it to fall flat or be done badly so I’m glad to hear that’s not the case! I think everyone involved had a lot of fun, while at the same time taking care to show the material its proper respect.